Islamist Watch, a project of the Middle East Forum, combats the ideas and institutions of lawful Islamism in the United States. Join its mailing list to keep abreast of these issues. "I prefer to die standing than living on my knees," explained Charlie Hebdo editor Stéphane Charbonnier. He was killed on January 7. The defiant hashtags and rallies that followed the Charlie Hebdo massacre have become increasingly distant memories amid a cavalcade of capitulations to the very Islamic blasphemy laws that inspired gunmen to commit murder over drawings of their prophet. Submission started early as many media outlets blurred, cropped, or declined to show the relevant cartoons. High-minded talk of sensitivity crumpled beneath obvious double standards. CNN steered clear of the Muhammad images even as the photo of a crucifix in urine adorned its website. New York Times executive editor Dean Baquet cited the need to consider "the Muslim family in Brooklyn who read us and is offended," but his paper had republished anti-Jewish cartoons from Iran. 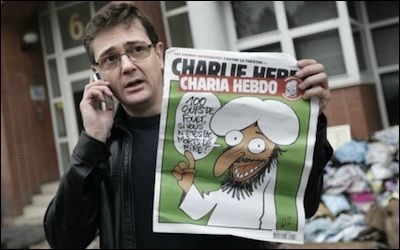 Media self-censorship began once more after Charlie Hebdo rolled out a "survivors' edition" with a tearful caricature of Muhammad. In one cringe-inducing episode, Sky News cut off Charlie Hebdo contributor Caroline Fourest when she attempted to display the cover on live television. Anxiety continues to take its toll. A German carnival canceled plans for a "float with a cartoonist forcing a pencil into the barrel of a terrorist's gun" because locals feared for their safety. Belgium's Hergé Museum nixed a tribute to the dead artists as it "doesn't want to fuel the fire." Security concerns likewise prompted London's Victoria and Albert Museum to delete from its website evidence of a poster that reverently depicts Muhammad, and an art installation featuring high-heeled shoes on Islamic prayer rugs was pulled from a show in France after a Muslim group warned of "uncontrollable, irresponsible incidents." Yes, mass murder could harm the Islamist enterprise in the long run, but currently it seems to be having the desired effect. In the wake of the Paris bloodshed, Rotterdam's mayor had harsh words for Muslims who live in the West but fail to adopt Western values. 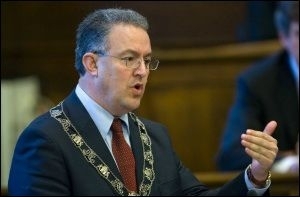 The no-nonsense mayor of Rotterdam has earned praise for his colorful remarks about Islamists. "If you don't like freedom, for heaven's sake pack your bags and leave," he declared during a TV appearance. "If you do not like it here because some humorists you don't like are making a newspaper, may I then say you can f**k off. … Vanish from the Netherlands if you cannot find your place here." A member of Geert Wilders' party? No, the mayor is Ahmed Aboutaleb, a Labour politician and a Muslim. He later repeated his comments at a mosque service. Aboutaleb is new to international headlines, but he has been pushing such themes for years. "If you think this society is depraved, then go," he said last fall, addressing those who seek to join the Syrian jihad. "Hand over your passport and risk getting bombed." As for what drives these individuals, he rejected the stale socioeconomic excuses and correctly zeroed in on "the idea of living in a country where the word of God rules." Equally noteworthy, while Washington was busy blaming the Muhammad-ridiculing Innocence of Muslims video for the Benghazi disaster, Aboutaleb urged Muslims to "try and see the funny side. … You can always make your own film on YouTube as a response." Keep at it, Mr. Mayor. Your voice is needed. In a decision often distorted by Islamists, a federal judge ruled that the U.S. government had "ample evidence" linking CAIR to Hamas. The Council on American-Islamic Relations (CAIR) has contacted the government of the United Arab Emirates to appeal its inclusion on that country's list of banned terrorist groups. And it is receiving help from friends in high places. Just before Christmas, CAIR and the Muslim American Society (MAS), which the Emiratis also consider to be a terrorist entity based on its ties to the Muslim Brotherhood, revealed that they had "met with senior U.S. government officials" about the matter. "The two American Muslim organizations and the U.S. government pledged to work together to achieve a positive solution to the UAE designations," they added. "It's an example of one branch of government treating CAIR as an innocent, legitimate organization while law enforcement … takes a more skeptical view," the Investigative Project observes, recalling that the FBI has distanced itself from CAIR due to concerns about the latter's involvement in a conspiracy to fund Hamas. With Washington now riding to their defense, CAIR and MAS will regain some lost credibility regardless of whether UAE authorities change direction. Perhaps the American Islamic Forum for Democracy, led by reformist Muslim Zuhdi Jasser, was wise to caution that the UAE's blacklisting of the groups would not be without cost. Britain "welcomes diversity, but this should not mean adopting legal practices that are hostile to our values," the London Telegraph editorialized in March 2014. The Law Society has finally paid attention. Opponents of Shari'a enjoyed a victory late last year as the Law Society of England and Wales, which represents solicitors and issues practice notes, dumped its guidance on writing wills that conform to Islamic law and pass muster in secular courts. "We reviewed the note in the light of criticism," said its president, Andrew Caplen. "We have withdrawn the note and we are sorry." When the document surfaced in March, the Law Society was roundly condemned for promoting principles of inheritance that discriminate against women, non-Muslims, and children born out of wedlock. "It would make the Suffragettes turn in their graves," lamented Baroness Caroline Cox, a campaigner for the rights of Muslim women. Now they are turning a bit less. During his stint as archbishop of Canterbury, Rowan Williams opined that incorporating Shari'a into the British legal system "seems unavoidable." 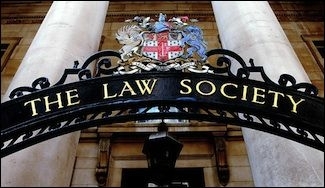 The Law Society's apologetic about-face reminds us that Shari'a creep can indeed be avoided if enough people say no.